KOKOMO, Ind. – In April, Ball State University athletics scored a major win – not on the football field or basketball courts – but in the front office. Much like the university did when it hired football coach Pete Lembo from a non-Mid-American Conference school, the athletic director position was filled from outside the conference. And the Cardinals did not settle for any small school administrator. Instead, they hired University of Notre Dame Deputy Director of Athletics Bill Scholl. The 1979 Irish graduate arrived at BSU after a 22-year career at Notre Dame and has extensive experience in marketing as well as being a football administrator. One of his major duties at Notre Dame was overseeing the Rockne Heritage Fund – the first-ever athletics annual fund that directly benefits student-athlete grant-in-aid scholarships. He also served as senior associate athletics director where he was the director for marketing and was executive director of the Notre Dame Monogram Club, an organization of Notre Dame student-athletes, student managers and cheerleaders who have earned monograms at Notre Dame. In addition, Scholl oversaw all aspects of the athletics ticket office, including ticketing, parking, staffing, systems and customer relations. His previous sport administration duties included providing supervision for the men’s soccer as well as assisting the director of athletics with the men’s basketball program. He also served as director of financial development for the 1987 International Summer Special Olympic Games. Scholl served in the same position for one year at South Bend’s Logan Center which offers services to persons with developmental disabilities. And now he brings that wealth of experience to Muncie and the Cardinals athletics program – and he said he was already knee deep in work. But before he talked about the department, he talked Cardinals football. He said as far as the department is concerned, it wants to put the athletes first – and he liked what he saw in exit interviews from previous letter-winners. He said one of the ways to make the program better is in the win-loss column – and that in-turn puts more smiles on student-athletes faces. “I think the MAC and other conference’s judge you on your overall play and we haven’t fared very well lately,” he said. “And we would like to see us moving towards the upper-half, if not the top, of the MAC in as many sports as possible. I think fielding successful teams is a critical piece of where we go. He also talked about his coaching staff, and on first glance, he likes what he sees. 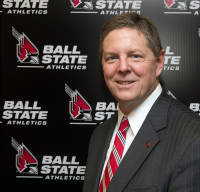 And that relates to one of the major reasons Ball State hired Scholl – his sports marketing background. Ball State’s hiring of Bill Scholl appears be a big step in the right direction as the Cardinals athletic program moves towards being the “it” athletic program of the MAC and other mid-major conferences. Chirp! Chirp! This entry was posted in Ball State. Bookmark the permalink.